The impressive 61.26 metre motor yacht Aurora has been sold with Moran Yacht & Ship representing the seller and Sean Doyle at Northrop & Johnson introducing the buyer. 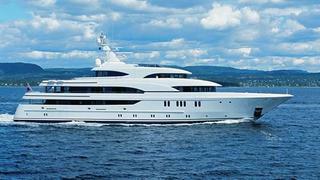 Originally named Phoenix, she was built in steel and aluminium by German yard Lurssen to Lloyds class with exterior and interior styling by Andrew Winch Designs and delivered in 2004. Built under the supervision of the Moran new construction team, she was refitted in 2010. Accommodation is for 12 guests in six large cabins consisting of a master suite on the main deck with a floating staircase to an upper deck study with panoramic views and a private owners foredeck. She also has five queen sized guest cabins with their own sophisticated decorative schemes, each with plasma television screens and marble en suite bathroom facilities. The extremely large sun deck/helicopter deck has a huge Jacuzzi tub with seating for ten. The Jacuzzi has been installed with a dedicated insulated storage tank which enables the tub to be emptied and refilled with immediate hot water. This area also features relaxing sun loungers for twelve guests. The superstructure has been significantly reinforced to permit landing and take off of a Bell Jet Ranger Helicopter. All of the aft safety rails are removable to facilitate this procedure. Forward on this deck is the bridge which is equipped with state of the art navigation equipment. Seating for four guests is located aft of the control station with a chart and navigation station located behind the seats. Twin 2,364hp MTU engines give her a cruising speed of 15 knots and a range of 7,700 nautical miles.